Are you desperate to experience another dimension of God's glory? If you seek His face, satisfaction is guaranteed. In His presence there is fullness of joy and at His right hand, there are limitless pleasures. _________________________________________________________ All around the world worshipers are awakening from a state of apathy to a passionate pursuit of the presence, power and glory of God. They are crying out for another dimension of intimacy and growth in their relationship with Christ. Judy Turnbull identifies key areas that will assist worshipers in positioning themselves to progressively grow and experience the manifested presence of the Lord. Being very transparent, she divulges personal experiences and the cry of her spirit as she pursues the glory of God. These pages are filled with encouragement for worshipers with like-passion as well as those who desire to develop a passion for God's manifested presence. __________________________________________________________ Judy Turnbull is an anointed worshiper who desires to see the glory of God in everything she does. She is an ordained minister, psalmist, and conference speaker who motivates and encourages others to worship the Lord with reckless abandonment. 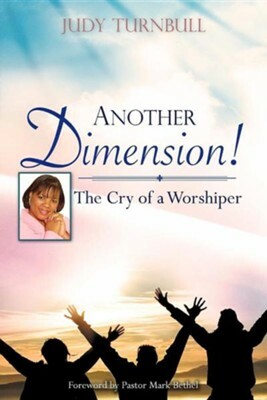 Judy has produced two anointed praise and worship CDs, Woman of Excellence Arise and Another Dimension, which are filled with songs penned from her experiences with Christ. She is the founder and president of Sounds of Jubilee Ministries Inc., with a mandate to produce an anointed prophetic sound in the earth that cultivates an environment for the manifestation of the King of Glory. She hosts an annual VI ASAPH Advance Worship Conference & Concert and ongoing Jubilee Praise and Worship events. She is also known for her ministry to hurting women. Judy is a registered nurse by profession. She and her husband David are blessed with two sons. They reside in the United States Virgin Islands. I'm the author/artist and I want to review Another Dimension!.